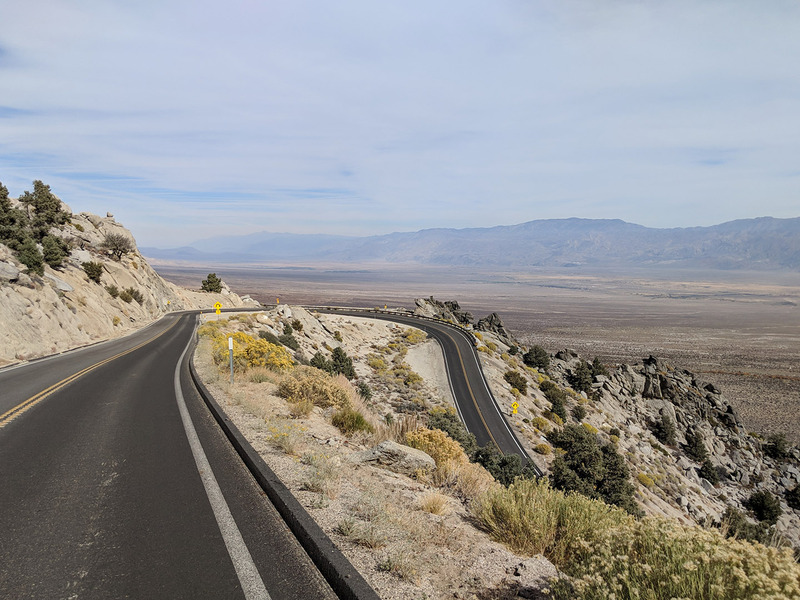 We're spending the fall meandering down California's Highway 395 and have been looking forward to arriving to the Alabama Hills in Lone Pine because we heard it was a "must do" for boondockers. 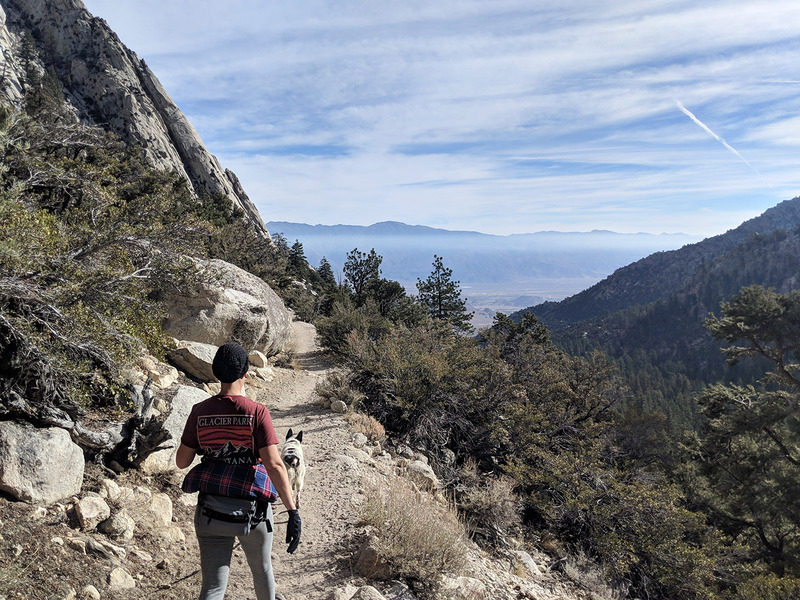 When the cold nights pushed us out of the Mammoth Lakes area, we were happy to continue south and descend a few thousand feet in elevation to warmer temps. 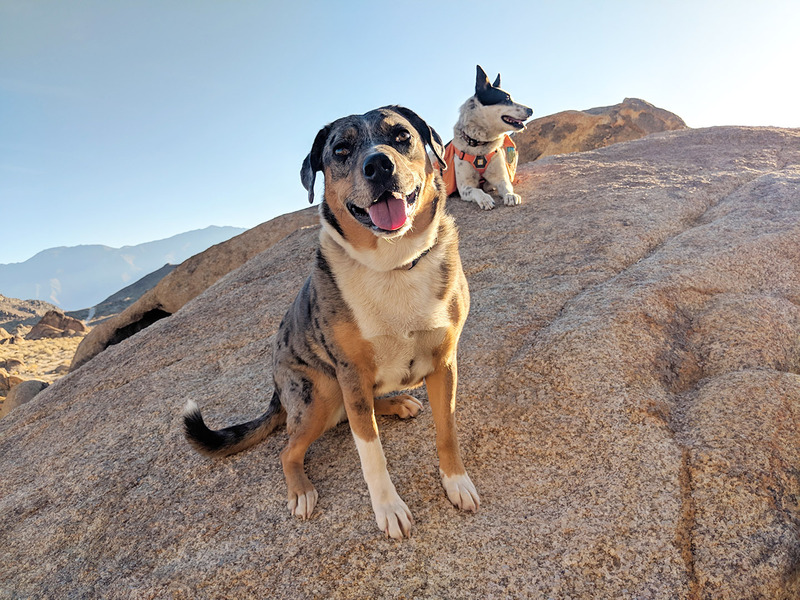 After spending two weeks at Alabama Hills, I have to say, it lives up to the Instagram hype – and it's a great spot for adventuredogs! 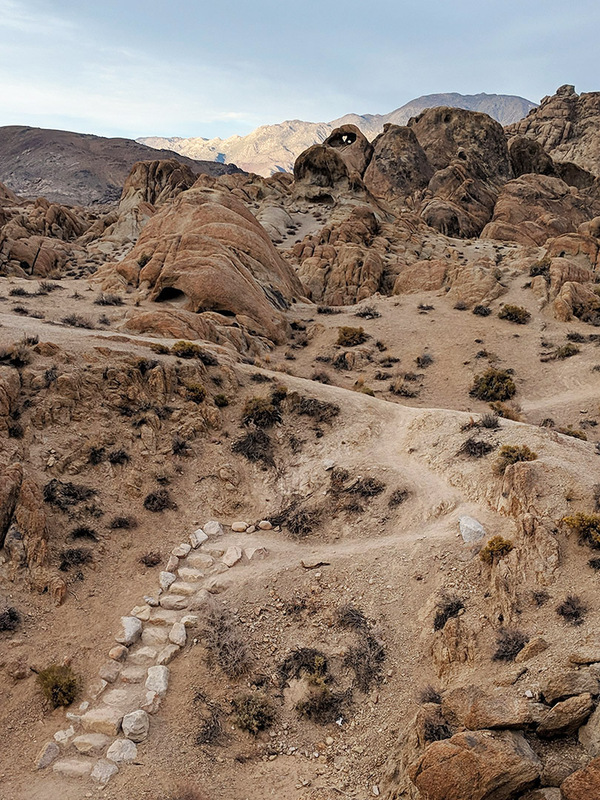 The Alabama Hills were not named after Alabama itself, but after several mining claims in the area that in turn were named after the CSS Alabama, a Confederate warship. 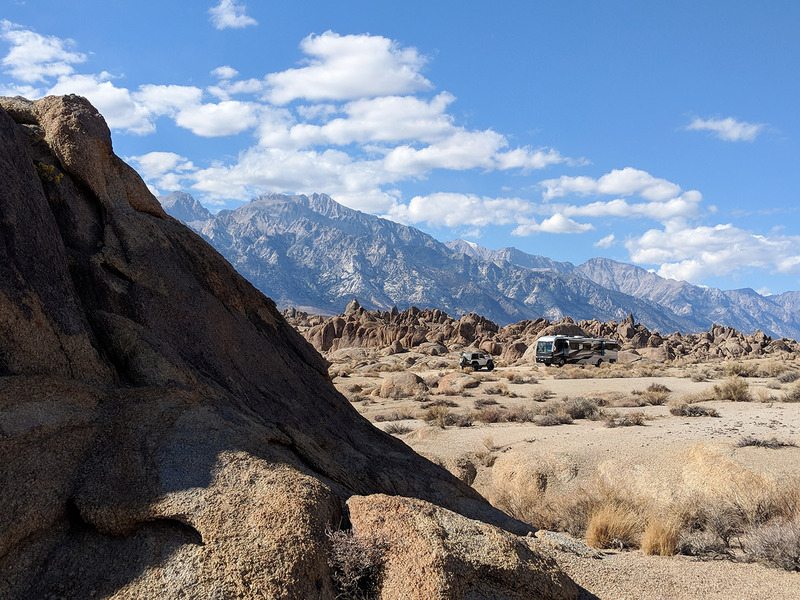 Today, the Alabama Hills are a popular filming destination. 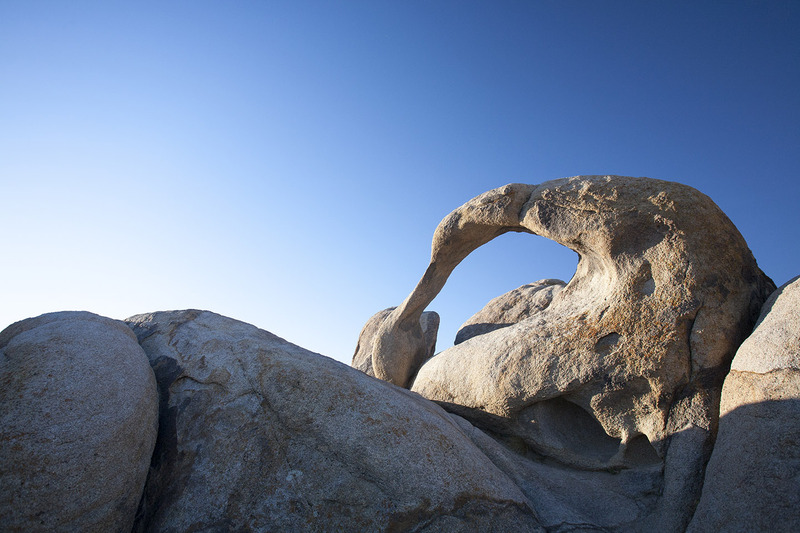 Hundreds of movies and countless commercials have been filmed at the Alabama Hills. In fact, a car commercial was being filmed on the aptly named Movie Road during our stay! Our goal upon arriving was to find a boondocking spot along Movie Road that had good enough cell signal for us to be able to work. We were given some tips by friends and found a spot with a strong AT&T signal which meant we could use our hotspot, and our phones for calls over wifi. Success! Can you spot our rig? It certainly looks tiny compared to towering Mt. Whitney. Here's a closer shot if you don't want to squint! 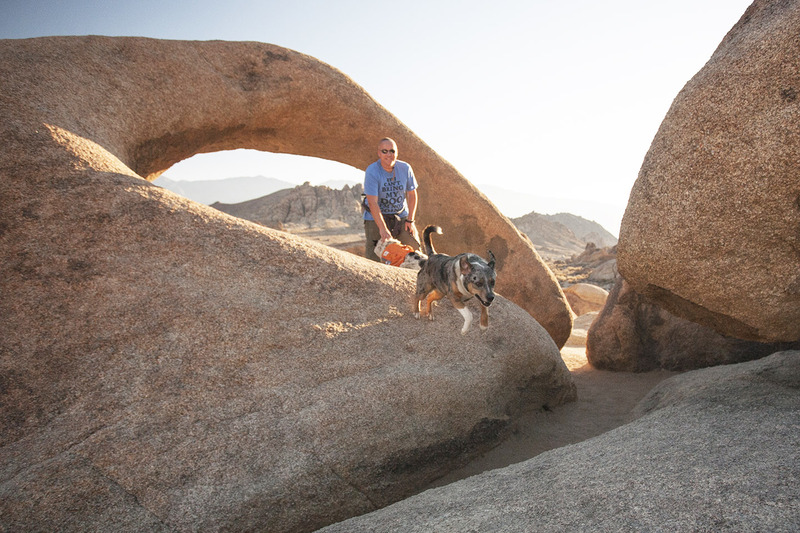 Our backup plan was Tuttle Creek Campground, which like the Alabama Hills, is also managed by BLM and nearby. Since it was so close, we went and scoped it out. It had plenty of spots, a dump station and fresh water fill. At $8/night for dry camping, it's a great alternative if all the free spots along Movie Road are taken. In our two week stay, we only scratched the surface on what you can do here (thanks, work! 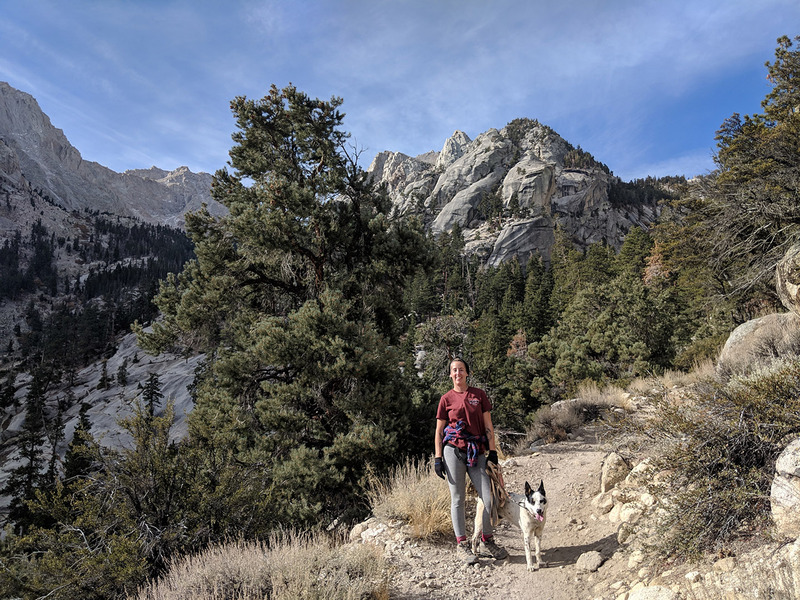 ), so by no means is our post the end-all-be-all of what to do in the Lone Pine area, but we would like to suggest some of our favorite dog-friendly activities from our stay! We loved being able to go for a great hike right from our campsite without having to get in the car! Our site was close to the Arch Loop Trail, which is a popular spot where you can see... (did you guess it?) Arches! Believe it or not, this is the view from the parking lot! So even if you don't hike far, it's still worth it. And do you see the first arch? When you get closer you can see it's the shape of a heart! 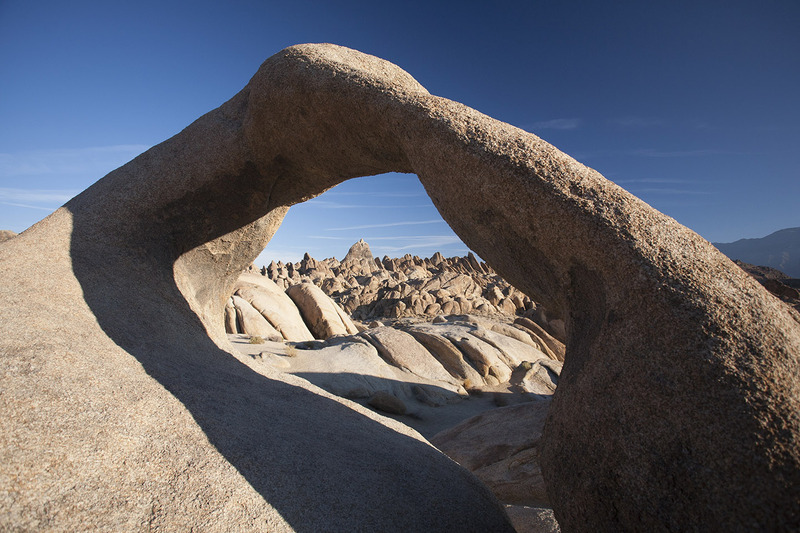 The most famous arch on this trail is Mobius Arch. I mean, come on. So beautiful! 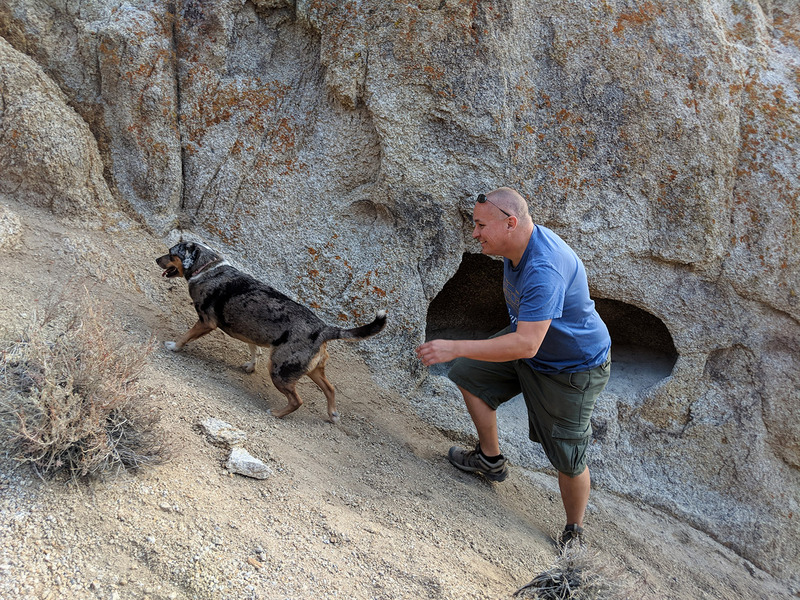 The dogs were super excited to be out on an early morning hike, so they didn't want to do any posing at this arch, but Lily did enjoy jumping back and forth between Tommi and I, so at least I got this adventuredog photo! If the Arch Loop Trail seems a bit busy, there are plenty of other ways to experience the "hills." This photo was taken on a short walk we did while checking out other available campsites on Movie Road. And you can explore off trail too. Just watch where you step and "Don't Crush the Brush." The steepness of hill you choose to climb is up to you! Be careful dragging leashes on the ground here. There are small prickly plants that get caught on the leash and stick in your palm. The thorns are hard to see with the naked eye, and getting them out will drive you crazy. 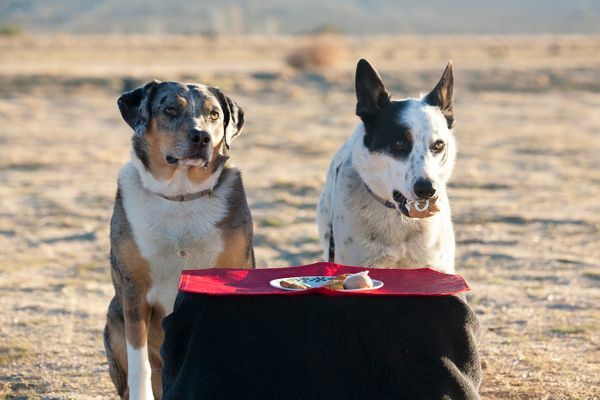 Luckily, the dogs didn't seem to even notice them with their thicker pads. If you're not familiar with Mt. 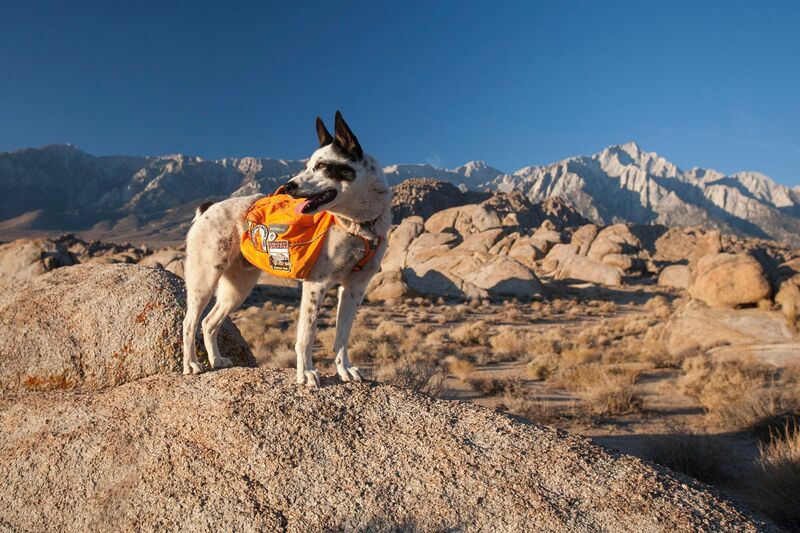 Whitney, it's the tallest mountain in California, as well as the highest summit in the lower 48 with an elevation of 14,505 feet! 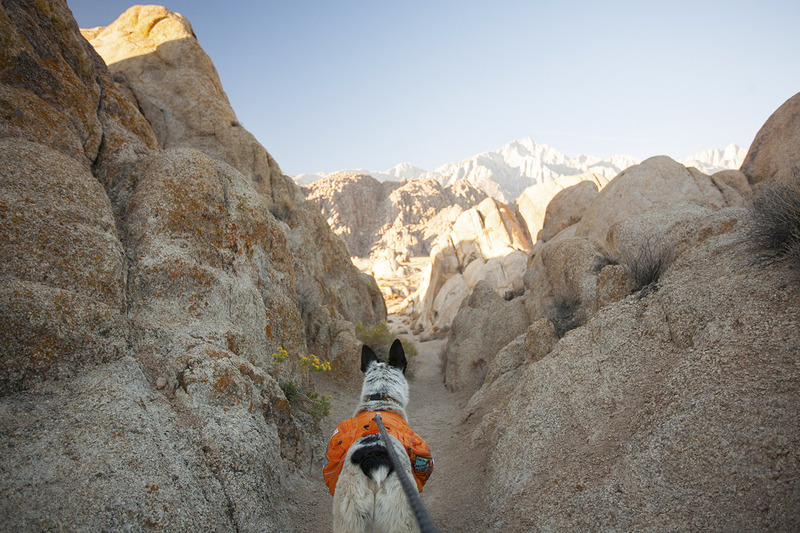 Whitney Portal is the starting point for hikers starting the 22-mile round trip adventure. Even if you have no intention of hiking Mt. Whitney, don't rule out driving up to Whitney Portal. 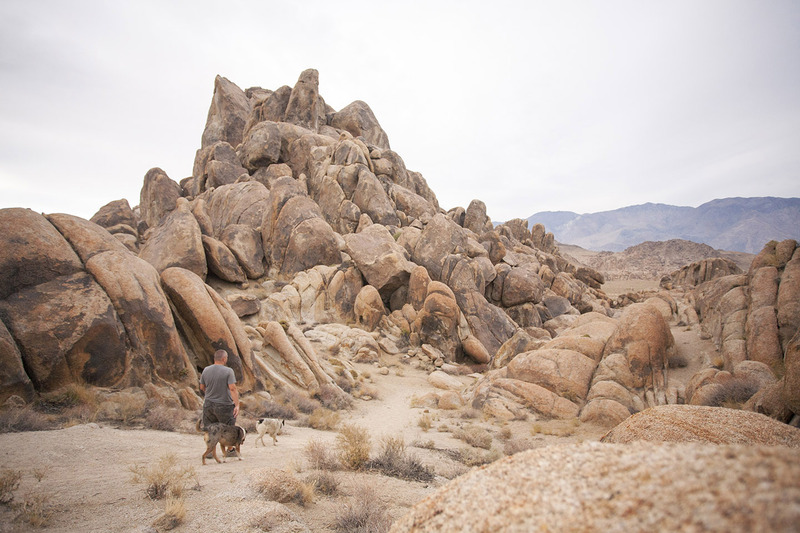 It's about a 10-mile drive from Alabama Hills and the road climbs about 4,000 feet. It's paved, but steep! 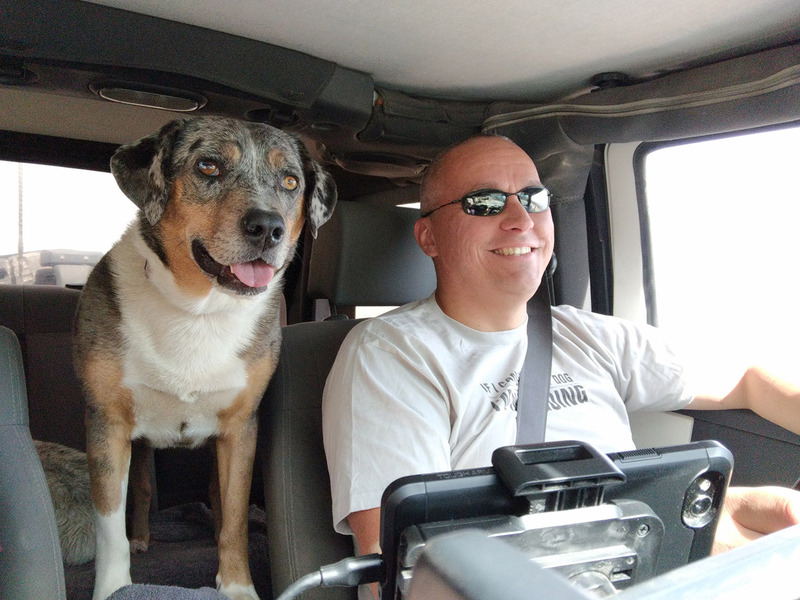 Can you tell from her face that Lily LOVES Jeep rides? Be ready for some hairpin turns. 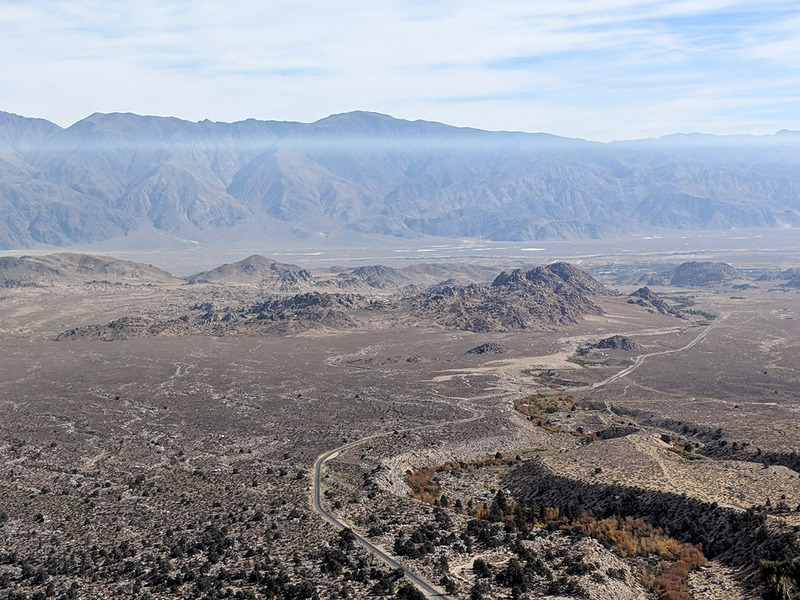 It was weird seeing the Alabama Hills from above, since they felt so unique at ground level, but then looked rather unimpressive from above! That's them, dead center. If you follow the stream down a bit, there's a great watering hole which must feel so good in the summer. But even Mushy didn't want to go in the frigid water in late October, which says something because usually I have to pull him out! Instead of jumping in, he would patiently wait for his stick to float towards him. The first 8 miles or so of the Mt. 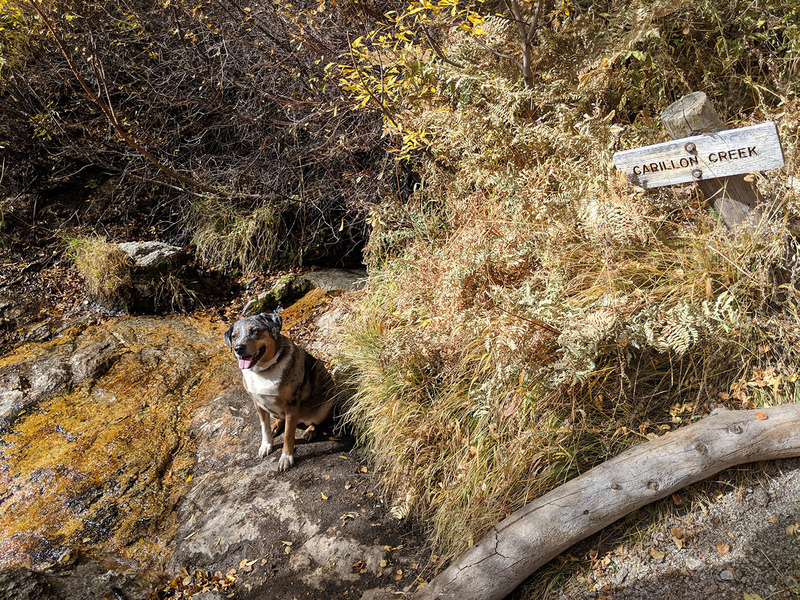 Whitney trail is dog-friendly. 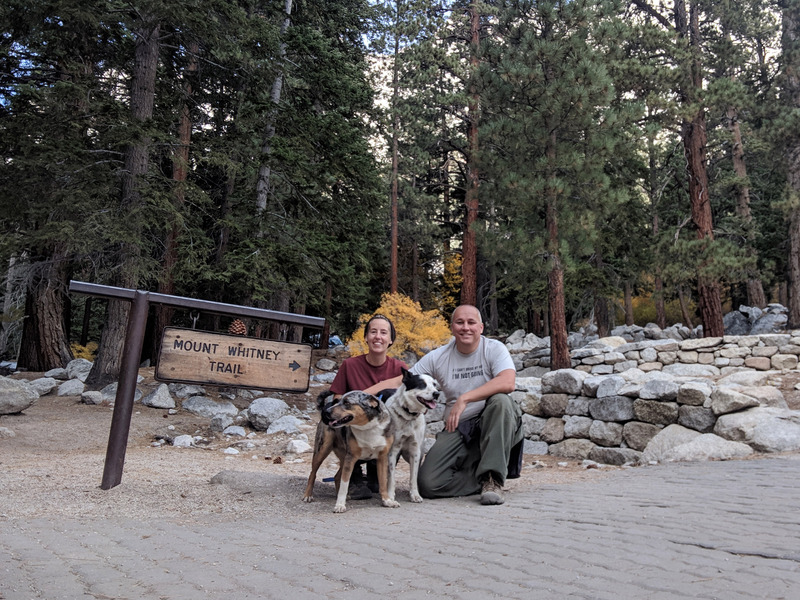 Dogs can't go all the way to the summit because the trail switches from being in the Inyo National Forest to the (non dog-friendly) Sequoia/Kings Canyon National Park in the last 3 miles. Now we can say we hiked (a teeny tiny fraction) of the 22-mile round trip Mt. Whitney trail! ...and on the way down. Neat to see the clouds sitting in the valley. We went as far as Carillon Creek and turned around. 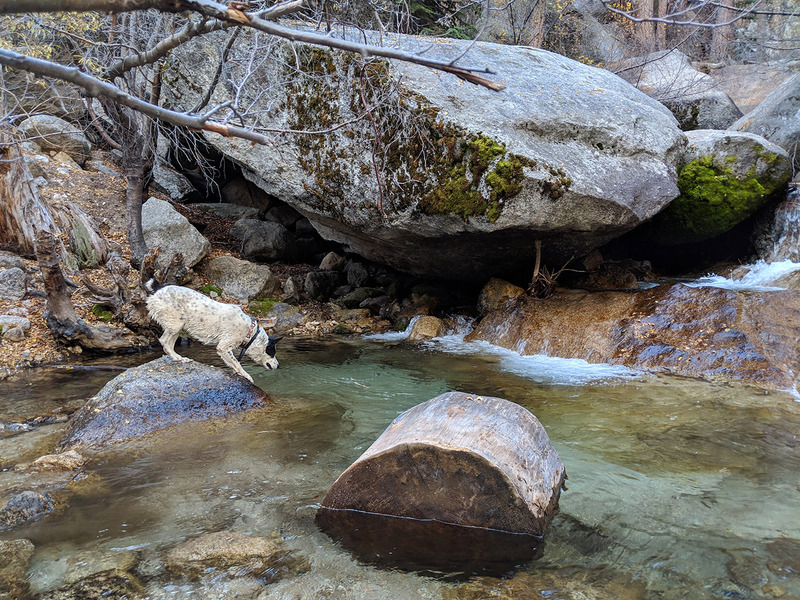 Although the creek is pretty small, arriving to it made us feel like we had accomplished something, and the dogs had fun walking through it a few times. We're not in great shape, but we're also not in bad shape, but boy that elevation change, along with hiking at 8,000 feet got us! We were pretty tired after our (embarrassingly short) 1-mile hike and I didn't drink enough water so I had a pretty bad headache in the afternoon. Drink more water than you think you need so you don't get altitude sickness. 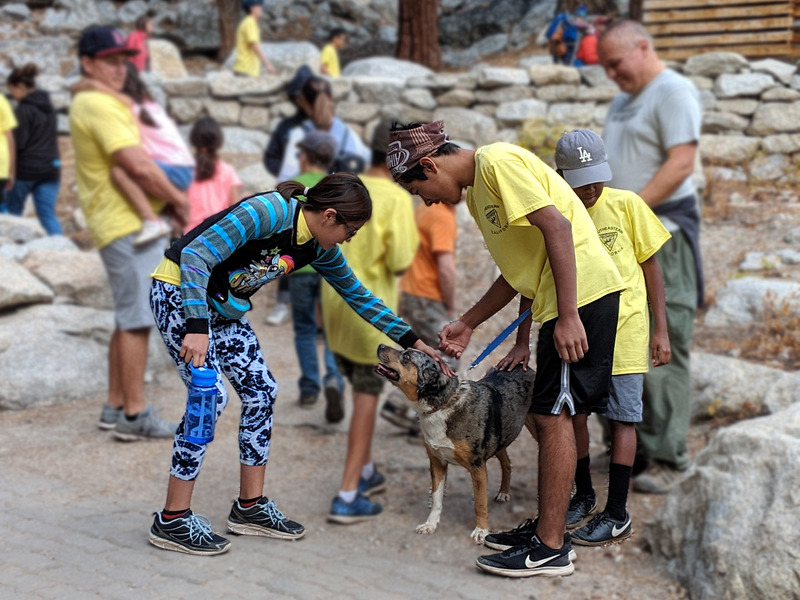 Lily Protip: If you're lucky, there will be a group of kids starting a field trip while you're ending your hike and if you're a good girl – they'll pet you! (Lily loves kids, so this was like THE BEST THING EVER). 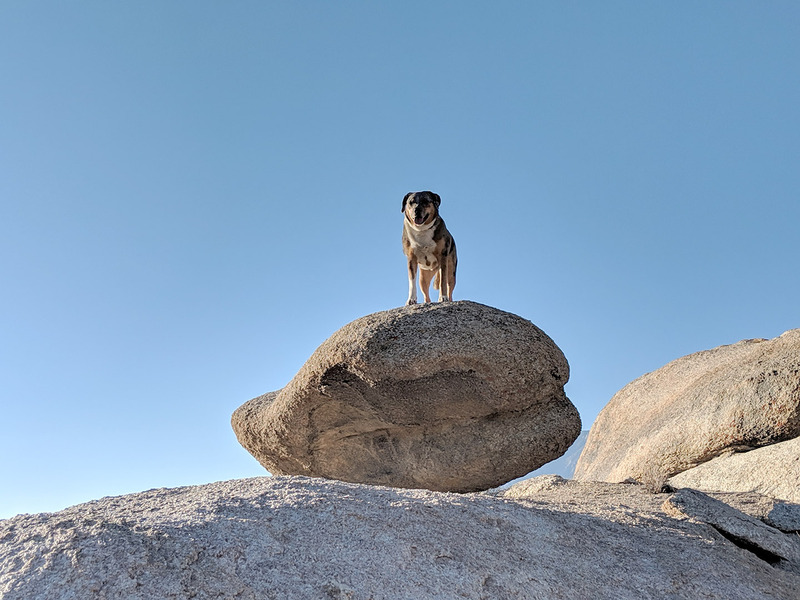 Our potato-shaped dog on a potato-shaped rock. Don't feel like you need a fancy camera to take amazing pictures here! 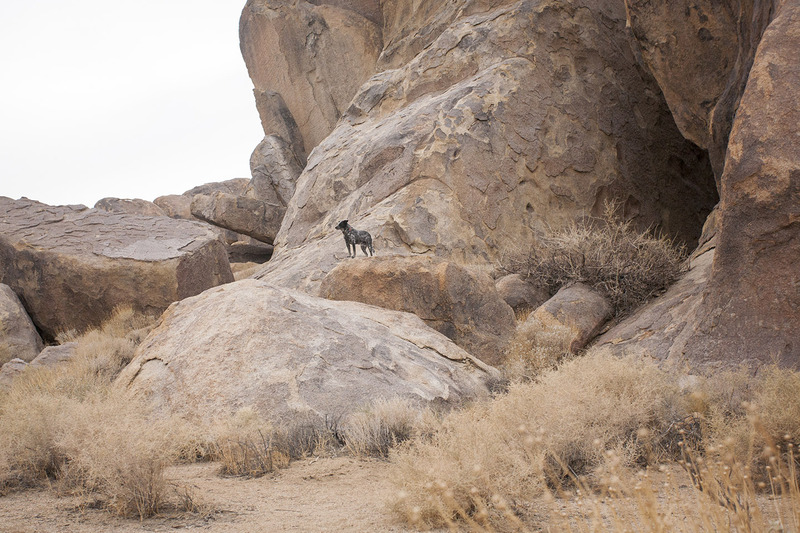 Just add one part dog to one part beautiful background and boom! Awesome photo. About half of the photos in this blog post were taken with a phone camera. Don't have a dog? No problem! I took this photo of someone else's dog! Last but not least, why not watch a movie that was filmed in the area? Since we happened to be visiting over Halloween, we chose Tremors! 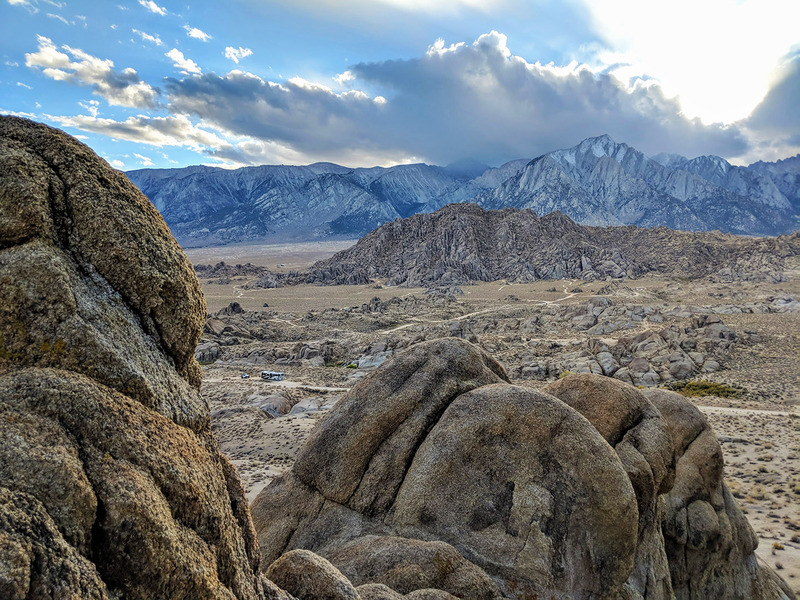 Okay, maybe not the best choice, but it was a fun "scary" movie filmed at the Alabama Hills that to get us in the Halloween spirit. Other good (better) choices might be: Django Unchained, Iron Man or one from this crazy long list! 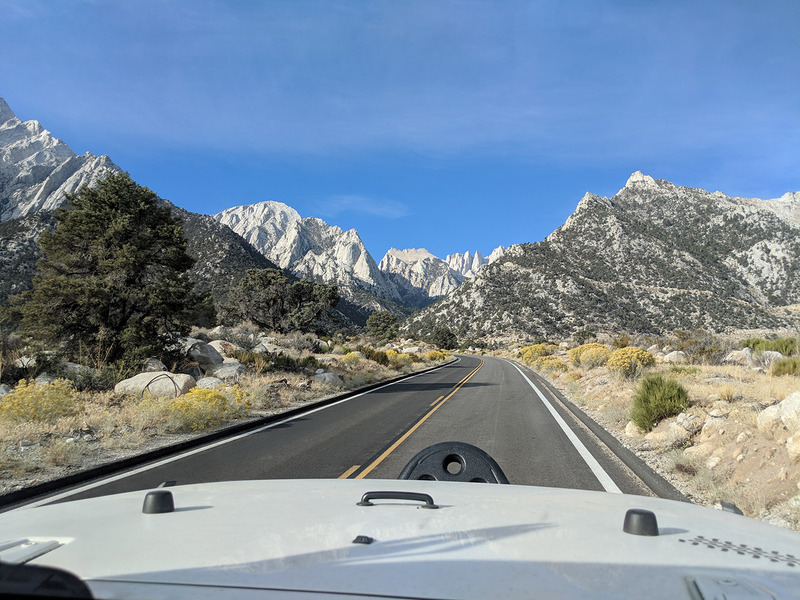 When our stay limit of 14 days was up (and yes the BLM ranger comes by and checks), we left the Alabama Hills and continued south down the 395. Sadly, we didn't get to everything on my list, like Horseshoe Meadows, but we always like to leave something to do for future visits, so I guess that's okay. 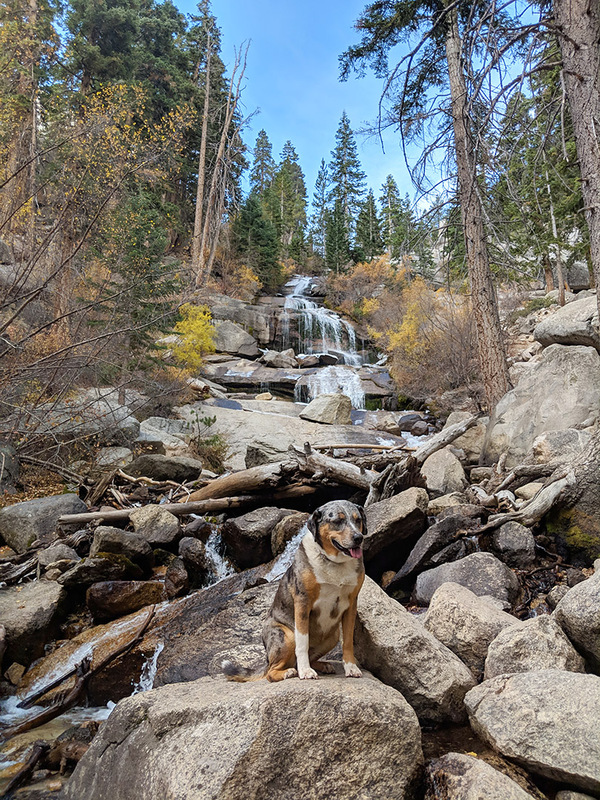 I'm also adding the dog-friendly hike to Lone Pine Lake to the list for next time!